Special Containment Procedures: SCP-XXXX is to be kept in a room with iron walls that are 1.22 (4 feet) meters thick; on a stool made of wood from a young (Approximately ten (10) to fifty (50) years old) ash tree. SCP-XXXX is to be kept in a locked chest no bigger than 10cm x 10cm, in a four (4) meter by four (4) meter room with iron walls that are 1.22 (4 feet) meters thick, The chest has to be made of wood from a young ash (Approximately ten (10) to fifty (50) years old) tree. It is unknown to why this is needed, only that it helps greatly in containment and control. The lock needs to be a silver padlock in fair condition and has to be connected to a 121.9 centimeter (4 foot) metal chain that is also made of silver. (Tests concluded that metal type does not matter with the chain.) It is to wrapped completely around the chest. The chest is to be monitored at all times through video surveillance. Guards need to be on full alert outside the containment chamber, in case a containment breach occurs. Personnel are not to enter the containment chamber unless granted access by one (1) Security Clearance Level 5 personnel. 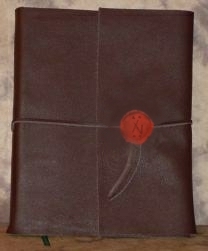 Description: SCP-XXXX appears to be an unlabeled, leather back book that is written in a language unknown to our database. It's 4 centimeters in length, 3 centimeters in width, and 8 centimeters in height. (4cm x 3cm x 8cm) It includes about 80 pages, including a two (2) page introduction on the book. All searches to uncover the language the book is written in, have concluded in failure. The material of the paper used in the book is currently unknown. The liquid used to write and draw in the book appears to be human blood mixed with indigo ink. Whether this is intentional or due to a shortage of an item is currently unknown. Subject is sealed shut with red wax that bares an unknown emblem, etched into it with what appears to be high amounts of heat. Attempts to open the seal have came up unsuccessful. Only Dr. █████ has been able to access the book; when asked what exactly is in the book, all he can say is, "It knows how." Dr. █████ ignores all further questioning on who "it" is and what he knows how to do. Illustrations in SCP-XXXX are said to contain vicious depictions of unknown beasts in terrifying detail, even some of the SCPs in the facility. The names of the creatures are bold under the illustration. Though unknown, they do give a glimpse of what the SCPs listed names could be. The book conjures up beasts at random times that walk around the room looking for an exit. The number of beasts is always between five (5) and eight (8) beasts within a twenty-four (24) hour period, and always one (1) at a time. Should this change, who ever is monitoring at the time should report immediately to Level 5 Security Clearance personnel. The beasts are always hostile, and are extremely deadly. Should a number of beasts try to break containment and succeed, send any available on-site Task Force immediately. Further researching on the book still continues as of writing. Acquisition: It came into the Foundation on █/5/19██. It was found in a small village in █████. Reports from surrounding communities said that strange rituals were going on in the area; including sacrifices, the kidnapping of children between the ages of █ and █, and the collection of animal bones. When Agents █████ and █████ went to the village, they found it was [DATA EXPUNGED], and only SCP-XXXX remained, unharmed. A group of four (4) Class D personnel were assigned into the containment chamber of SCP-XXXX. Five (5) minutes inside the containment chamber, the subjects started to show signs of aggression, anxiety, and minor insanity. They then gathered into a circle around the stool and started chanting unknown words. The book started to emit a strange glow, then made the class D personnel lose all human instinct; resulting in the class Ds to start tearing away at each other. Twelve (12) minutes after the test, the Class D personnel were eradicated on site. Containment Procedures for subject has been changed due to a containment breach. Resulting in the death of █5 persons. Addendum - 003: As of 8/2/1995, SCP-XXXX has shown signs of being sentient; the subject attempted to communicate and persuade two on-duty guards, nearly resulting in a second containment breach. SCP-XXXX has received the 'Keter' object class.